It's no wonder that the overwhelming majority of PV systems installed in the United States today are batteryless grid-tied systems. With only three main components—the modules, inverters, and production meter—these systems are more efficient, and less complex and expensive, than their battery-based counterparts. Compared to a batteryless grid-tied PV system, an installed grid-tied PV system with battery backup may be 20% to 40% more expensive depending upon the storage capacity of the battery bank. 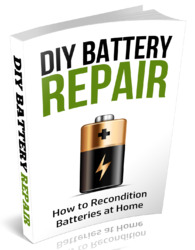 Besides the higher up-front expense of a battery-based system, in most situations, the batteries will need to be replaced every seven to eight years. This additional cost further reduces the economic viability of a grid-tied PV system with battery backup. It also is difficult to predict the future costs for batteries as the prices for lead have quadrupled over the last five years alone. Batteryless grid-tied PV systems are commonly wired at high DC voltages (120 to 600 VDC), due to the voltage input requirements of the batteryless inverters. Wiring arrays for high voltage reduces the amount of current the wires must carry, which also reduces the wiring expense, since smaller-gauge wire can be used, along with smaller conduit and conduit fittings. Also, because grid-tied PV arrays are wired for higher voltages (which means more modules in series and fewer modules in parallel), this can reduce and sometimes eliminate the need for combiner boxes and series fuses. All PV systems have inherent losses due to temperature, module soiling, inverter efficiency, and transmission. But when you add a battery bank to this system, the necessity of keeping batteries fully charged and ready to supply backup energy takes a toll on overall system efficiency. A modern grid-tied system with battery backup will be 5% to 10% less efficient than a batteryless grid-tied system. These efficiency losses depend in part on the type of charge controller and inverter used, and how deeply and how often the batteries are cycled. One way to increase the efficiency of a battery-based PV system is to use a maximum power point tracking (MPPT) charge controller and avoid using older battery-based grid-tied inverters that are designed to float-charge the batteries overnight. The power-conditioning and utility-feed components of a grid-direct PV system. Most on-grid systems with battery backup use relatively small battery banks. When determining battery capacity, either the space available for the battery bank limits the amount of backup or the desired storage capacity drives the size of the battery bank. The decisions faced are similar to sizing battery capacity in off-grid systems, where days without solar are weighed against reliance on a backup engine generator. The up-front cost of battery banks of various capacities and quality will come into play too. But using a small bank will restrict the number of backup loads and / or the amount of time the backup loads can run. For example, a 48 V, 100 AH battery bank may only be able to deliver about 3.5 KWH to the loads. Roughly speaking, this amount of stored energy could power an efficient refrigerator, and some lighting and home electronics for 24 hours or so if the bank was discharged to a recommended maximum of 80%, with 20% capacity remaining. Compared to battery-based PV systems, grid-direct systems require little or no maintenance. However, many small-scale battery backup systems now use sealed lead-acid batteries, which eliminates the need for regular watering, reducing maintenance requirements. 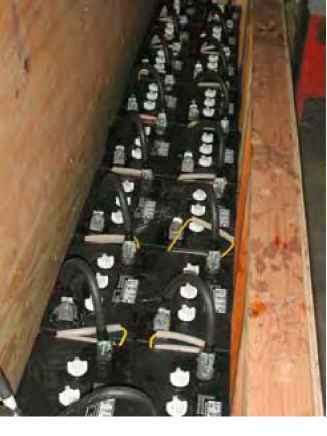 If flooded lead-acid batteries are used, be prepared for regular maintenance, such as checking electrolyte levels and adding distilled water. Another option for batteryless grid-tied PV system owners is to add batteries later without having to completely rewire the PV array or swap out an already-installed grid-direct inverter. This "AC-coupling" strategy synchronizes the AC output of a batteryless inverter to a utility-interactive battery-based inverter. 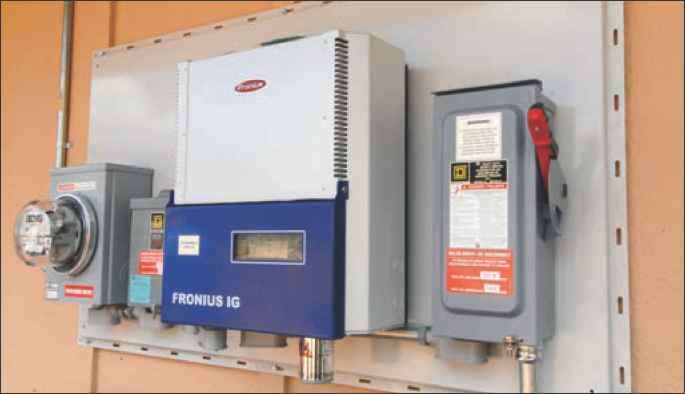 If utility power fails, both inverters are disconnected from the grid as required, but unlike strictly batteryless systems, the grid-direct inverter will continue to capture solar energy for household loads and route excess energy to charge the battery bank. If the PV system is generating more power than is required by the load or battery bank, the output of the batteryless inverter is stopped, ramped down, or routed to a diversion load like an air or water heater. The exact control approach depends on the equipment used. Inverter manufacturer SMA America pioneered AC-coupled systems. During a utility outage, the battery-based inverter controls the output level of the batteryless inverters based on load demand. However, many systems have been installed that use a variety of batteryless inverters AC coupled to utility-interactive battery-based inverters manufactured by OutBack and Xantrex. An AC-coupled approach still requires purchasing a utility-interactive battery-based inverter, and a battery bank and all the accompanying battery BOS components. It also requires installing a critical load panel. However, the existing PV array and grid-tied inverter (and its higher efficiency) can then be utilized with the security of a battery bank for backup power. Ryan Mayfield ([email protected]) has a degree in environmental engineering from Humboldt State University and lives in Corvallis, Oregon. He teaches PV classes at Lane Community College and Solar Energy International, and is a principal at Renewable Energy Associates, a firm focusing on PV system design, implementation, commissioning, and industry-related training. He holds a renewable energy technician license in Oregon.